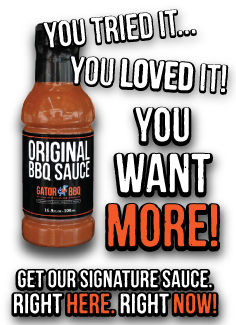 Gator BBQ was formed in 1983 by a gentleman from Naples Florida by the name of Don Brown (a.k.a. the King of Ribs). Don was also the manager of Michelbobs Rib House in Naples Florida. In 1983 Don started to tour in Canada and the US winning numerous awards. Don later sold Gator BBQ to Larry Kimball who managed the business until 2001. Larry then sold the business to Larry Murphy of Alabama so he could concentrate on his restaurant in Flint Michigan. In 2006 Matthew and Louise Smith acquired Gator BBQ and haven’t looked back. It is now family-run business with children Kurt, Nick, Aaron and Alexis all contributing to its success. We now tour Ontario and the Northern U.S. States doing upwards of 30 ribfests a year. Some of the awards we have won in 2008 were first place ribs Rochester New York, Best Pig Rig, Burlington Ontario, Best Food Booth Norfolk County Fair – to name a few. So if you would like to do something special for your outdoor event or your catering needs give us a call at Gator BBQ.